What was Grandma doing on this Saturday a hundred years ago today? Maybe she went out with friends and wore her new blue and black boucle coat. Did Grandma ever wish that she had some furs? They were really popular in 1914. It is interesting to see the new furs, soft scarfs, muffs, and coats of unbelievable lightness, with hats that harmonize and strike the right note. Posted on November 14, 2014 November 13, 2014 by SherylPosted in FashionTagged 1914. Pelts were very popular! I love the images! The women look so glamorous in a old-fashioned kind of way. Very stylish. My grandmother had a fur stole complete with the creatures’ feet. It was weirdly fascinating. I can remember a woman who sat a few rows in front of my family in church when I was a child who often wore a mink stole that included the animals’ heads and feet–and, as you said, it was fascinating in an odd sort of way. 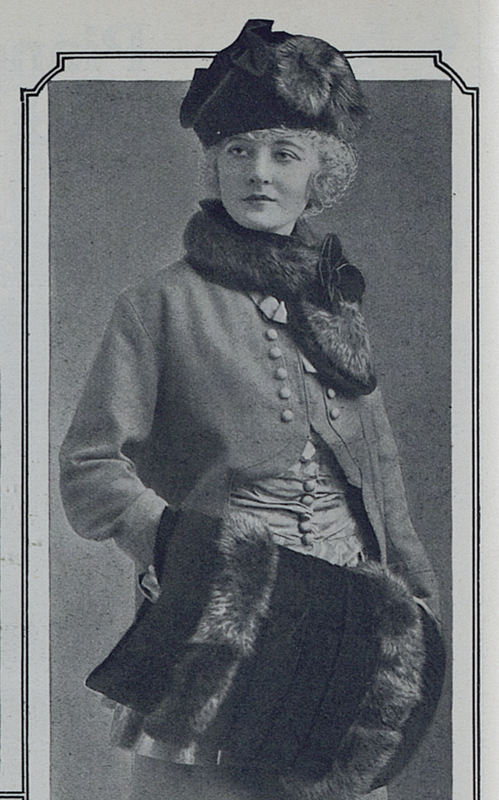 When I was young I can remember stylish women wearing mink stoles and coats. Now I occasionally see similar coats in flea markets on sale for next to nothing–and somehow it makes me feel a little sad. Interesting- these garments still resemble the animals they came from. The hat in the second illustration is odd! It looks really odd to me too, but I guess that it was considered stylish that the time. I’ve seen a number of 1914 fashion illustrations that include hats with a few feathers sticking out at odd angles. Are those muffs? I’ve been fascinated by those since my childhood. I had a Skipper Doll (friend to Barbie) who came dressed in a red skating outfit complete with a white fur muff. Those ladies do look elegant, but I could never wear real fur. Yes, they are amazing large muffs. I think that you and I are probably about the same age. I can also remember thinking that muffs were very glamorous when I was a child. I had a little white fake fur muff (probably similar to Skipper’s) that I absolutely loved. Fantastic images! The detail to these ensembles is really striking and, of course, always the hat. Back when ladies “dressed” to go out in public. I’m a very casual person and am really glad that I don’t need to “dress” to go out–but a tiny piece of me thinks that it would be fun to occasionally get dressed up like they did years ago. More than a tiny piece of me would love it, Sheryl! I enjoy dressing up but rarely have the occasion to do so. My tiara just doesn’t seem to fit in at the local Food Lion. LOL! I also knew someone with a fur piece similar to what you describe. I agree–weirdly fascinating is a good description of it. The cruelty involved then, and now, will never make wearing fur as a fashion statement attractive to me. My grandmother had a fox neck wrap and to me, as a child, it was always a dead animal, much more beautiful alive and running through a field. I can remember asking my mother when I was a child why some women wore furs that still had the animal heads and feet attached. I know what you mean. I also had a muff once. I think that I was about 6 years old, and I thought that I looked incredibly beautiful when I wore it. Not only fashionable, I bet they were warm too. They do look very warm. My dear Grandma Dora had a beautiful silver fox jacket that I would borrow when I would visit her. She said I could have it someday and indeed I do have her silver fox coat. I would not wear it for fear Peta would spray paint me. Meanwhile, it hangs in my coat closet bringing me memories of my grandmother each time I see it or run my fingers into the fur. What a lovely story. It’s wonderful that you have the coat as a memory of your grandmother.. They do seem like they are from a different time and place. i have over twenty fox stolls with head and feet..
A few years ago I bought one with the head and feet at a flea market. I’m not sure why. I guess it somehow reminded me of the old days when rich women wore them–and I couldn’t believe that they can be bought for next to nothing now.